I was at the Downtown Disney Lego store today, and they had put out all 5 of the Friends-esque Disney Princess sets. Per store staff, they won't be available on [email protected] until 1/1/13. After all the sales we've seen from so many places, MSRP stings a bit, but there are going to be some happy kids in my house in 2 weeks. Orlando or Anaheim? I'll be at Anaheim this weekend, hope to pick one or two. Sorry for the delay, it was the Orlando store. They also had put out the new Friends sets that some here have spotted at Toys R Us. Per store staff, they won't be available on [email protected] until 1/1/13. The Disney sets arrived in the Raleigh LEGO store this afternoon and look outstanding with their Friendish minifigs. Look fantastic to me, too. Not out in the NYC Rockefeller store yet. Checked Cleveland, not going to stock them, period. (Hand slap to the forehead). They were working on stocking them in Columbus OH. A little more pricey than I was expecting, but the sets look great. In stock in Chandler, AZ. In stock in Elizabeth, NJ. $20 for the Brave one and $30 for the Little Mermaid one. I didn't look at the pricing on Rapunzel, Cinderella's carriage, or the castle. Curious, did you see the smallest Ariel set? I want that one a lot but it isn't available at the LEGO Store just yet. Saw these at my local lego store yesterday. The castle looked very nice. Priced at $69.99. Will buy when they go on sale at other retailers. 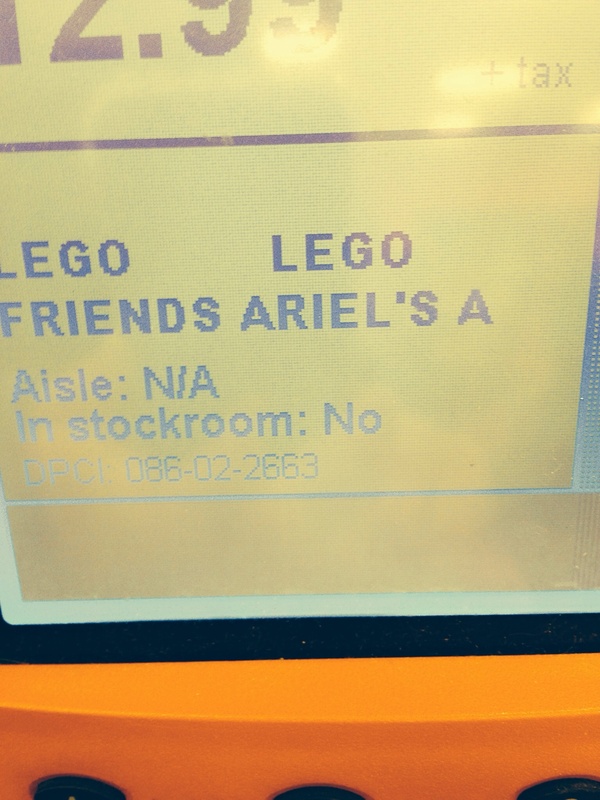 No sorry, I just saw one Rapunzel and one Merida and they were in the Lego reps cart. I suspect they have them all at the store but they just aren't out yet. Can the hair pieces fit with regular minifig heads? Does anyone know how much the small Ariel set is? That's 41052 (Ariel's kiss) though, isn't it? I meant 41050 (Ariel's treasure) - that one is only 77 pieces, they can't possibly try to charge $30 for that? ^ I didn't realize there was a smaller one. With that piece count, I would think that would be the $11.99 or $12.99 pricing typical of small licensed sets. The Brave set was 24.99 at TRU so probably 19.99 everywhere else. Yes. The Brave set was 19.99 at the Lego store. I bought that one for the bears. They are hanging out on my ski slope. We had some crazy shelf elves here that were trying to put together that set. ^Any link to pictures or set number for the Brave set, I am curious about those bears. ^41051. Just google Disney Merida LEGO and you will find some images. Found it, I forgot her name was Merida. The bears are cute. Now they should just make a family of deer already! I know there was a fawn in the friends series packs but its face did not convince me as a fawn, it looked as round as the bears' faces. Yes, that was one Lego friend animal I was unhappy with. I am not sure what on earth was up with the face. I saw it too, it was either 11.99 or 12.99. I ended up getting Cinderella's carriage for my daughter for Christmas - looking forward to seeing her surprise since she has no idea about them :) I really liked all the sets, they're very much in the general Friends doll house style set-up, I bet they will do very very well. Westchester NY store has them in stock, as well as Ninjago, City, Hobbit, and misc other 2014 stuff.